Natural gas from shale rock promises to provide cleaner, abundant energy for the U.S. and the world. But there's a catch. It could come with significant environmental and social costs. Can the energy industry deliver the goods so that everyone benefits? For more than a decade, Bonnie Burnett and her husband Truman have owned a second home in the hilly farmland of Bradford County, in northeastern Pennsylvania. It was a getaway for the Burnetts (who live three hours to the south, in Stroudsburg), a place to take their grandchildren for a swim in the wooded pond that lies just a few steps from their front door. "It used to be heaven here," says Bonnie. "We were going to move here to live." The Burnetts say their plans changed when a natural gas drilling operation on an adjacent property started less than 400 ft. (122 m) from their house. 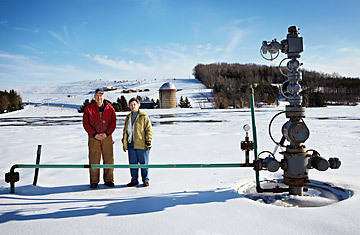 It was one of thousands of wells that have been drilled in Pennsylvania as part of a booming natural gas rush. In June 2009, when the Burnetts were home in Stroudsburg, tens of thousands of gallons of drilling water that had been stored on the well pad spilled, leaking downhill and into the Burnetts' trees and pond. Truman says that spill ruined a 50-ft. (15 m) swath of forest and affected their water. The pond seems lifeless, and the bass and perch that the Burnetts once fished with their grandchildren are gone. Even after the accident, the well is still running. The Burnetts can hear the hum of a gas compressor running 24 hours a day. "Did it ruin my life?" asks a tearful Bonnie. "I'd have to say yes." Dave DeCristo of nearby Canton, Pa., can see wells from his home too, but that's where any similarity with the Burnetts ends. DeCristo moved to this rural community to work as a plumber before he launched a gas station and a fuel-support outfit. He did well, but his businesses really took off in 2008, when drilling companies eager for the region's natural gas began setting up shop, and he's added dozens of employees. In addition, DeCristo  like other landowners around the region has sold a gas company the right to drill on his land. There's a well not far from his front door. "I could never dream I was going to be able to grow this big," he says. "I've been a blessed person because of this." Until recently, natural gas was the forgotten stepsister of fuels. It provides about a quarter of U.S. electricity and heats over 60 million American homes, but it's always been limited  more expensive than dirty coal, dirtier than nuclear or renewables. Much of Europe depends on gas for heating and some electricity  but the bulk of the supply comes from Russia, which hasn't hesitated to use energy as a form of political blackmail. The fuels of the future were going to be solar, wind and nuclear. "The history of natural gas in the U.S. has been a roller-coaster ride," says Tony Meggs, a co-chair of a 2010 Massachusetts Institute of Technology gas study. "It's been up and down and up and down." Watch TIME's video "Oil Spill Anxiety on the Bayou."